I often wonder, what it is that make certain food so evocative, decades later? 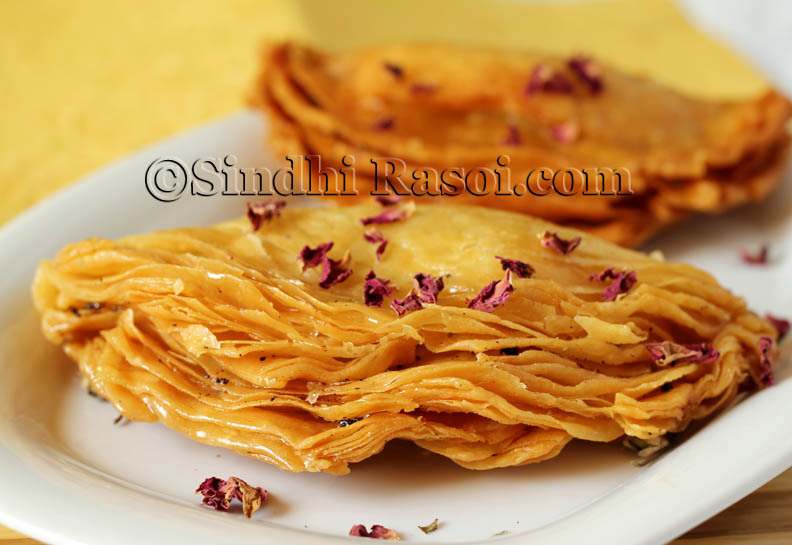 The smell of besan being roasted, triggers the memories of my mother making Sindhi Kadhi on weekends. The sight of corn on the cob, being roasted on charcoal, reminds me of the monsoon evenings, when a lime with salt and chili powder rubbed over a hot corn on the cob, would turn it into a most delightful after- school snack. The luscious mulberries, takes my mind back to those vacation days, when me and my cousins would climb on the half wall to pluck the juicy mulberries (Not sure if those were Jungli toot/Paper Mulberries ) from a tree outside a religious place ( while elders were busy praying inside). The stained pockets filled with mushy berries would turn into a nightmare, when the Aunts used to confront us regarding our adventures. 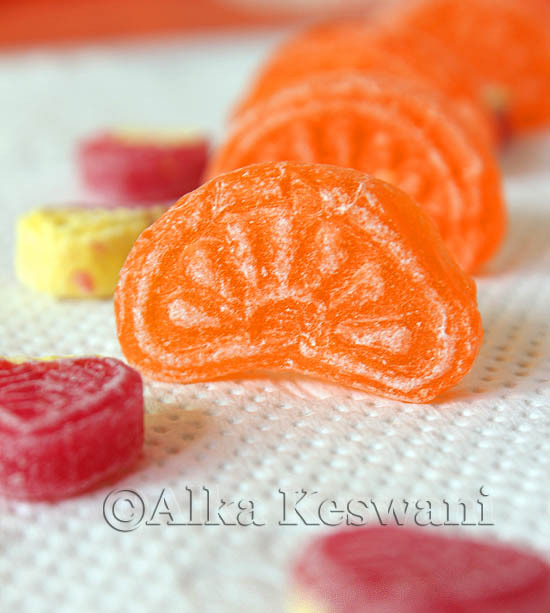 The plain orange candy always bring a smile on my face, since it reminds me of the games we played as kids, with our plastic /steel, toy kitchen sets.The crushed candies dissolved into the water were served as sherbet, while the powdered Marie biscuits used to be the ‘food’ we apparently ‘cooked’ in the toy utensils. 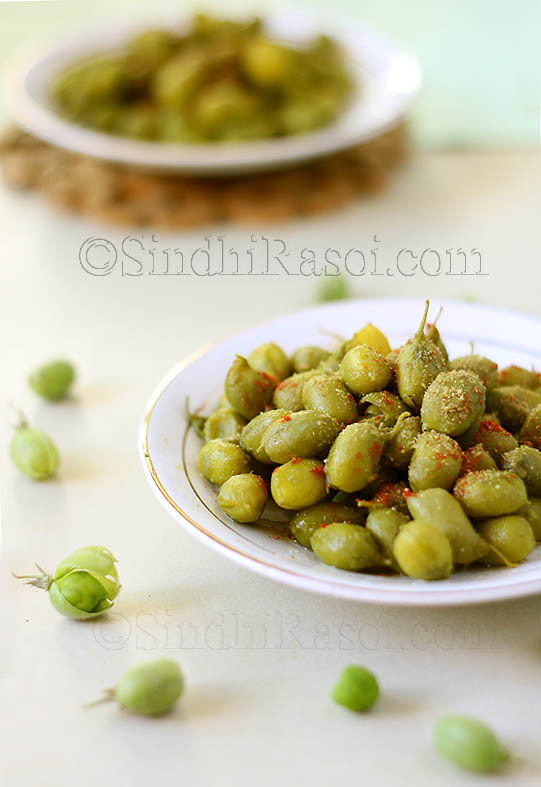 I still hunt out for Pabhori (Lotus pods) and fresh garbanzo beans, every season, just to walk down the memory lane when we were blessed to enjoy the healthy bounty of nature. 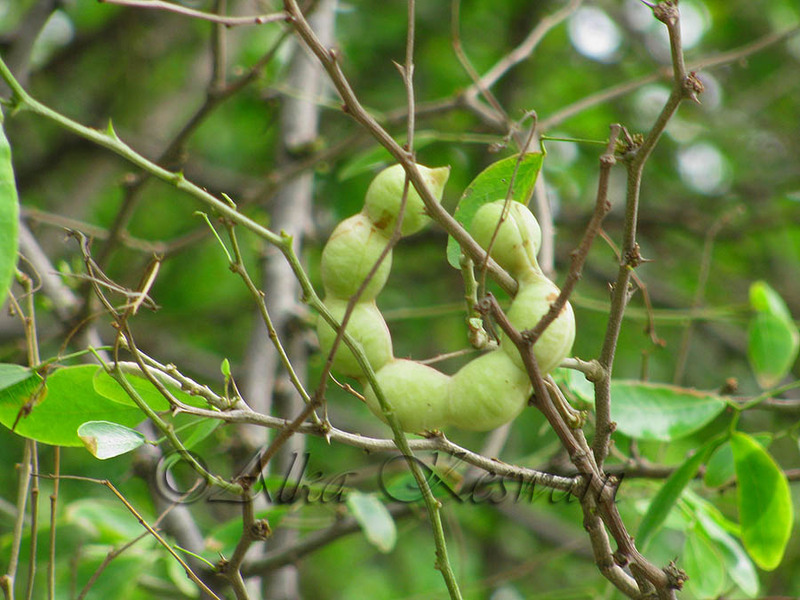 The karvanda (Conkerberry), bher (Ziziphus), dhadhree (tiny green pods), jungjalebi (jungle jalebi or Pithecellobium dulce ), chilled cucumbers, juicy Zetoon/Jaytoon (Guava), heeramoti (Indian Jujube) sold outside the school on tiny carts, sums up our childhood! 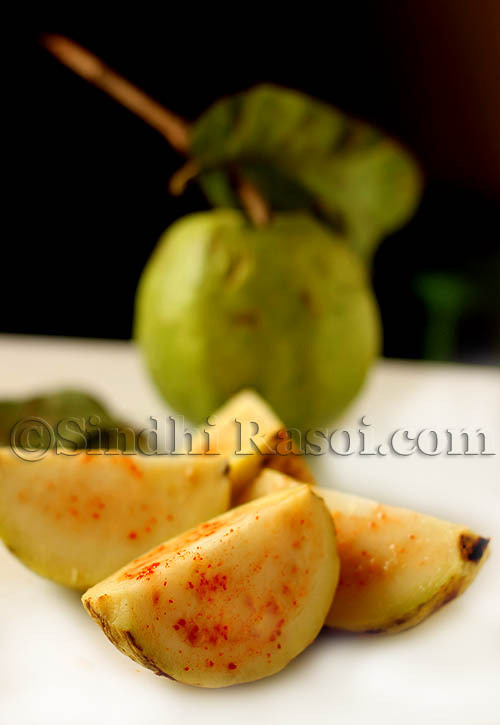 We would flock to the cart that would carry fruits along with a tiny plastic bag filled with special masala (Coarse salt mixed with red chilly powder and optionally some amchoor powder) to get our fruits smeared with masala salt. 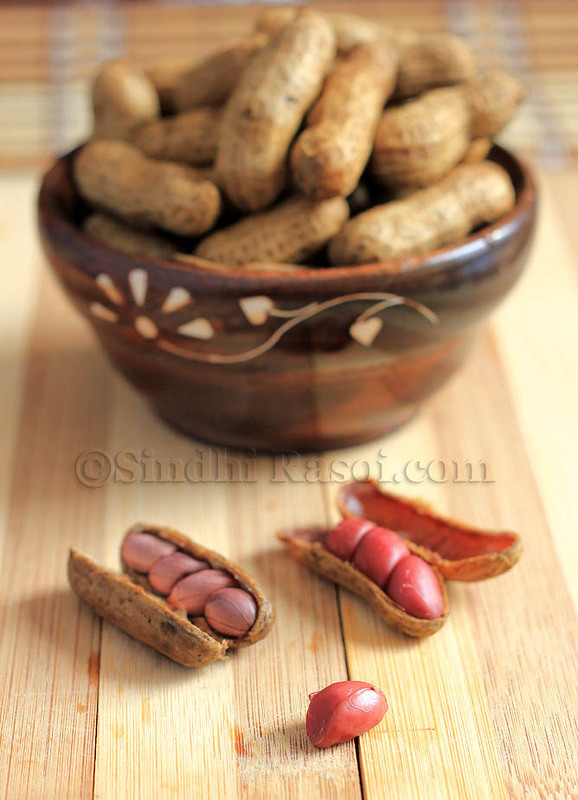 Even today when I boil the whole peanuts, I remember the days, when a plateful of hot, freshly boiled peanuts or the boiled whole fresh garbanzo beans, spiced up our gossip sessions with friends. I almost cried a few tears, when I saw Gul beda (Mini biscuits topped with sugar cream) after around 15 years. 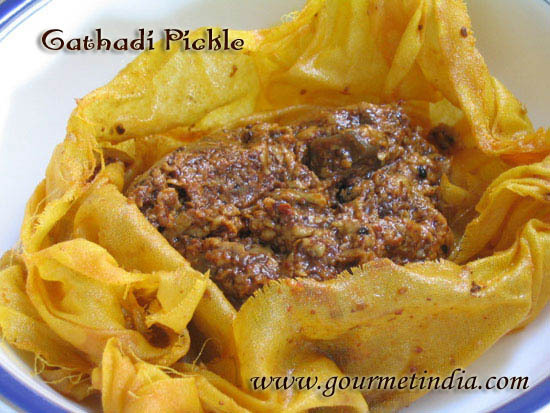 Dal pakwan, Praghree, Ghear etc always remind me of the Holi festival, since it used to be a ritual to hog on these Sindhi specialties, after playing a marathon Holi for hours together. The drenched, multi coloured, exhausted, hungry beasts (we, the kids) used to savor every bite of crunchy pakwan and praghree before digging into the juicy, sweet, syrupy ghear. 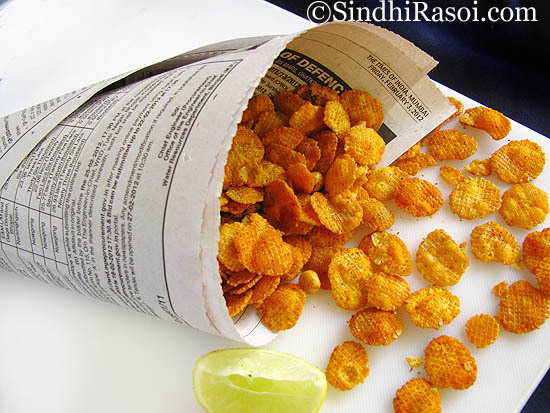 The street vendors, then, were not the strangers but the kind ‘uncles’ who made our evenings more enjoyable with their ‘chana jor garam’, Panipuri, bhelpuri, Khuney ja bhee ( Melt in the mouth, steamed lotus stem, topped with green chutney), aloo chat, tiny samosas etc. Then there used to be an elderly person, called Radhey, who used to carry hot gulabjamun during winter, across the streets. During summer, he used to sell most delicious Kulfi I had ever relished. A big aluminum box, that he used to carry with him, contained many aluminum moulds, on the bed of salt and ice along with wooden ice cream sticks. The malai kulfi cost us just half a rupee ( 50 paise) while the Pista malai kulfi could be bought for 1 INR. Sunday mornings were dedicated to the Ramayana, and Mahabharata while waiting for the elderly man to bring to us, the sweet delicacies. 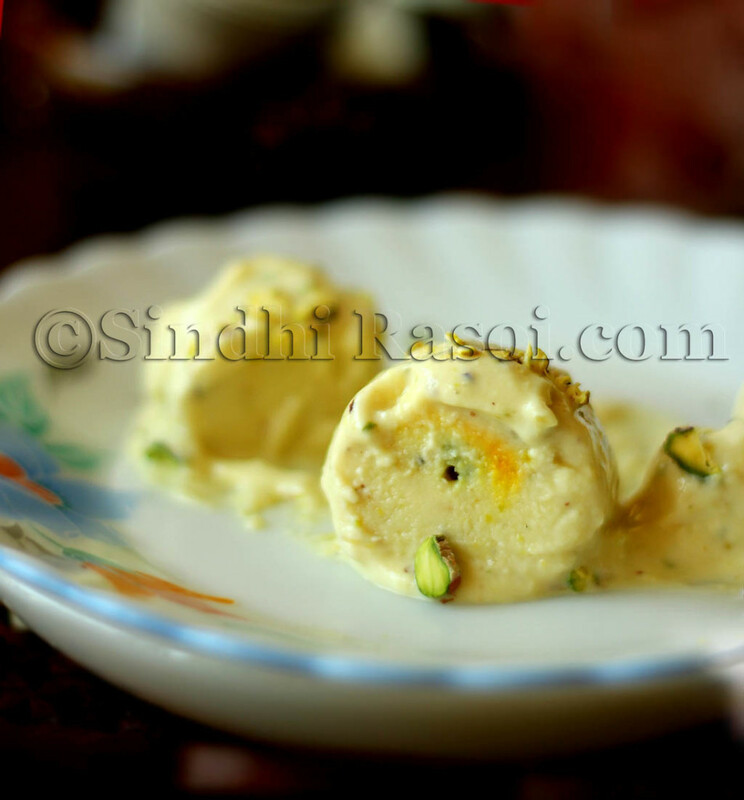 Ah, the pleasure of licking the sweet, creamy, devoid of any preservatives, cool Kulfi on a hot summer day ! 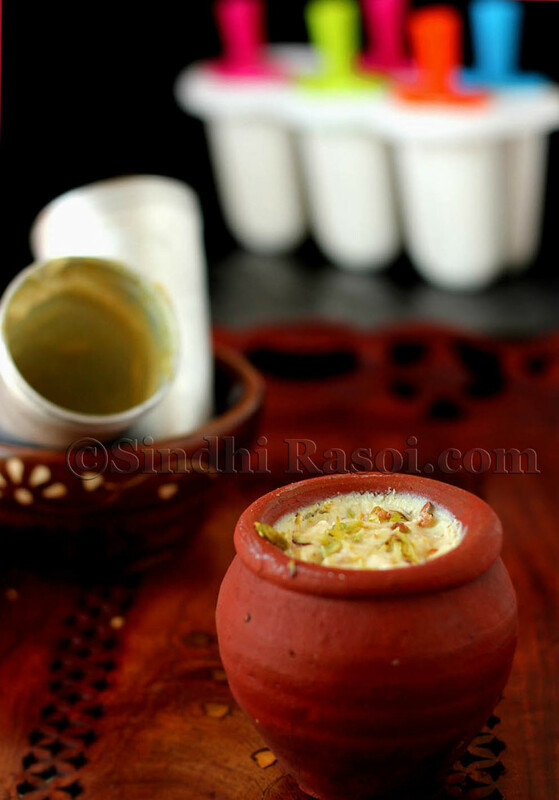 So while reliving all the foodie moments, I had this urge to make the Kesar Pista Kulfi, and here it is, the delicious, cool, sweet, creamy smooth, saffron kissed pista kulfi ! Enjoy! Boil the milk, along with condensed milk, stirring frequently to avoid scalding of milk. In the meantime, powder the pistachios and cardamom seeds together, using a grinder. Add this powder to the milk and let it simmer for a while. When the milk is almost reduced to half, add the cornflour dissolved in milk. Stir well. Add the soaked saffron and simmer till milk reduces to half of it's original volume. Let the creamy milk cool for a while. 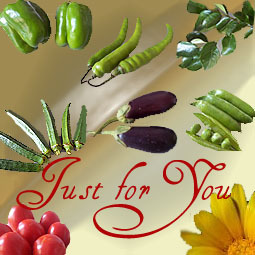 Pour in moulds (Aluminum or plastic), or in earthen pots (Kullhar). Always soak the earthen ware in cold water for at least 30-60 minutes before using them.Cover the mouth of matka/kullhar with aluminum foil. 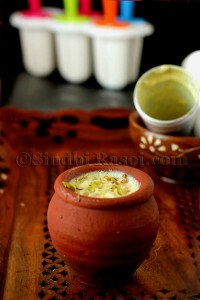 When the mixture cools down to room temperature, transfer the moulds to the freezer and let the Kulfi set for minimum 5-6 hours..
For un-moulding, just place the moulds (with secured lids) under running water for few seconds or 'rub' them between your palms and then insert a clean icecream stick or toothpick and pull out the Kulfi. 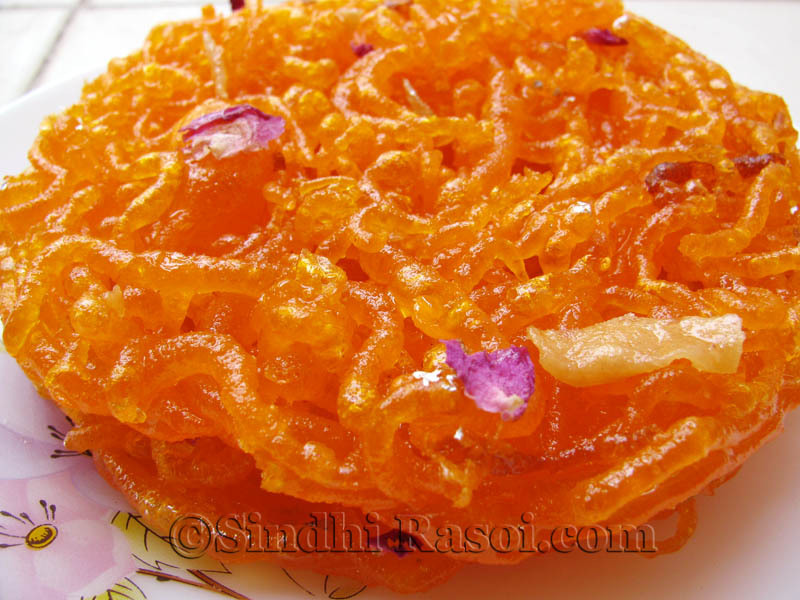 Serving suggestions: You can serve it with a dash of rose syrup. The kulfi tastes awesome when paired with strawberry or raspberry jelly, some falooda ( type of sweetened vermicelli),rose syrup, basil seeds and crushed ice (optional). 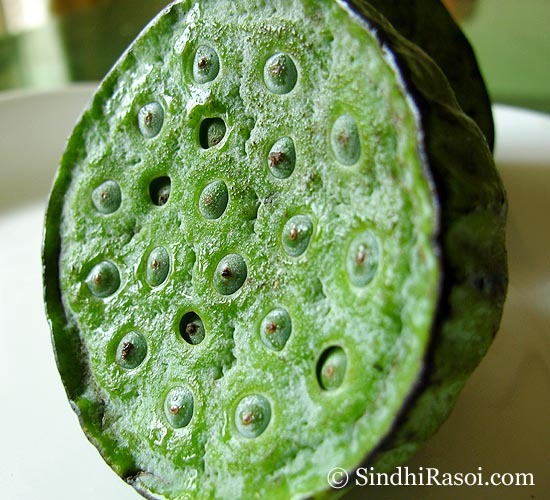 From the given quantity of ingredients, I could fill 3 aluminum moulds, 5 plastic Popsicle moulds and one kullhar. 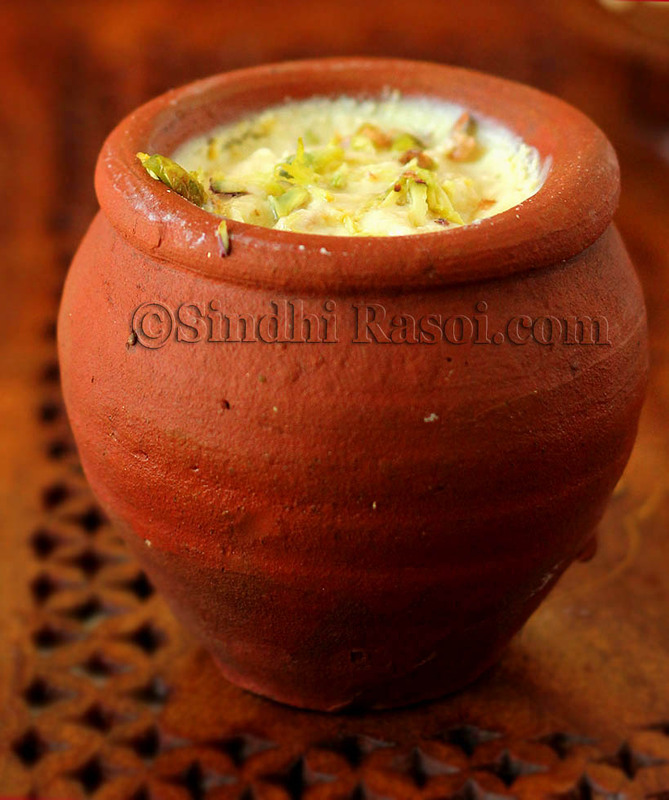 The hint of earthy flavors, in matka kulfi! Enjoy before it melts ! it seems realy beautiful but how can I remove it from earthern potsor kulhar? your recipe is amazing. I tried it and could not believe so amazing it was. 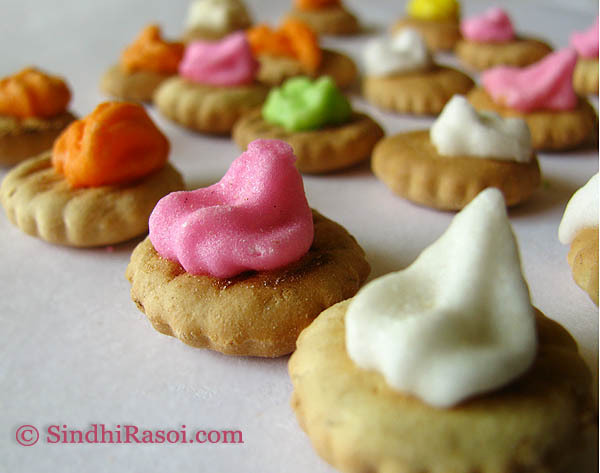 Lovely recipe n relived our childhood through your post.